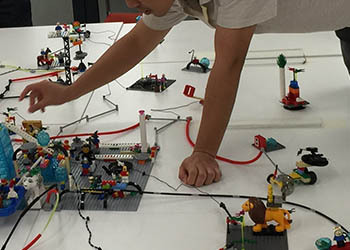 In this interview our CEO & MD, Mat East, explains how Lego is a lot more than just a toy. 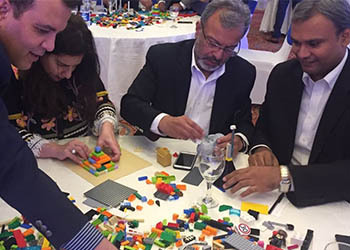 A certified LEGO® SERIOUS PLAY® facilitator, Mat believes Lego Serious Play is a highly effective business tool that engages participants on many levels and allows each individual to explore, express and share their opinions. ‘This is truly unique, and is seriously shaking up the concept of conventional development engagements’ – Mat East. What appeal does LEGO SERIOUS PLAY hold for you? Well for me it is something very special that allows individuals and organisations to develop an inclusive mindset that allows freedom of expression in a safe environment where everyone, no matter what role or responsibility within the organisation, can be part of the development journey. So why is it so effective? 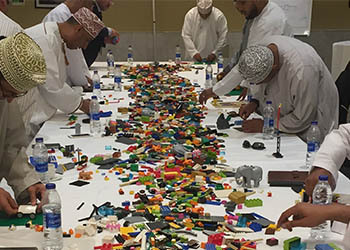 LEGO SERIOUS PLAY breaks habitual thinking. As humans we tend to look for the first pattern that fits what we know, and then stay with it. A strong subject matter expertise often leads us to feel that we know what to look for, and hence will only look for that. We find data that supports us and, unfortunately, unconsciously ignore other information and miss surprising and valuable patterns. So how exactly does it break this ‘habitual thinking’? Every single LEGO piece or combination of pieces has a meaning to the model builder. So in effect the bricks become the metaphor. Using your hands to build metaphorical or symbolic models unlocks your knowledge and helps you to develop new ways of thinking. This in turn uncovers and creates individual ideas and insights. Why does LEGO SERIOUS PLAY get results quicker? What do you come away with as an individual? As an individual you feel energised and valued. You have been given a chance to be involved with a scenario or problem, your opinion has been heard and you have contributed to the outcome or solution. It is a total ‘inclusive experience’ like no other! What do you come away with as an organisation? As the problem or scenario starts to unfold you will gain a clearer understanding from an organisational point of view of what the issues are and what you need to do next. Depending on the length and number of sessions the questions can delve deeper finally leading to a better understanding of where the challenges are and more importantly, what next steps are required to provide solutions. This question gets asked a lot! My simple answer is that it can be used for all the challenges that organisations currently face within the workplace. 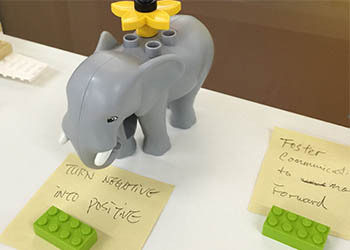 It can give tangible outcomes – for example some of our clients have used LEGO SERIOUS PLAY to define their company vision and mission statements; others to improve communication, decision making, team building, and guiding principles. 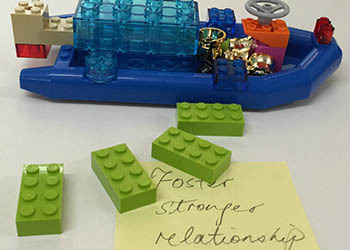 Some clients have used LEGO SERIOUS PLAY to help understand their own strengths and the strengths of their team. Workshops are always customised around your objectives and specific needs – the outcome and learning will come from those taking part.